The Key West Jetpack is an adventure for people who enjoy great emotions. Because you will be flying like a bird and feeling the excitement. The Jetpack uses water to push you up. The professional instructor will be with you all the way with a communication through a waterproof wireless radio. Therefore, once you feel in control of your Jetpack, your instructor will let you fly solo. This is an exciting feeling full of emotions and freedom. In fact, you will experience levitation and your adrenaline will exceed any other expectations you had before in any other water venture. However, until you are in full control and with a complete balance your instructor will let you do it alone. The amazing Jetpack adventure is for everyone who wants to live with excitement and wants to be in control. The Jetpack is the perfect sport to fly over the deep and the blue waters of the Keys in Florida. Until now, this was only a dream. But now, you can do it and you will fly and look around and enjoy the moment of freedom and safety at the same time. 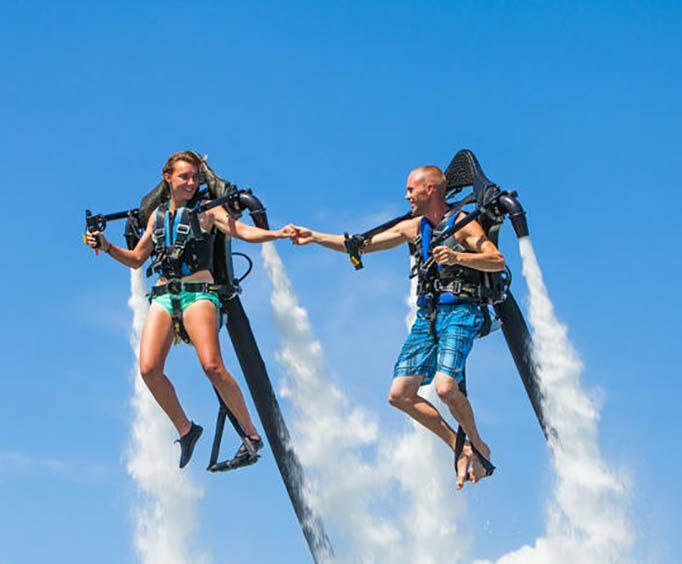 The Key West Jetpack uses water as the jet propulsion, you will be safe and in control after only six or eight minutes of flying. This impressive and innovative concept is for everyone that has the intentions to live to the fullest every day. It's a bird, it's a plane, it's a Jetlev! 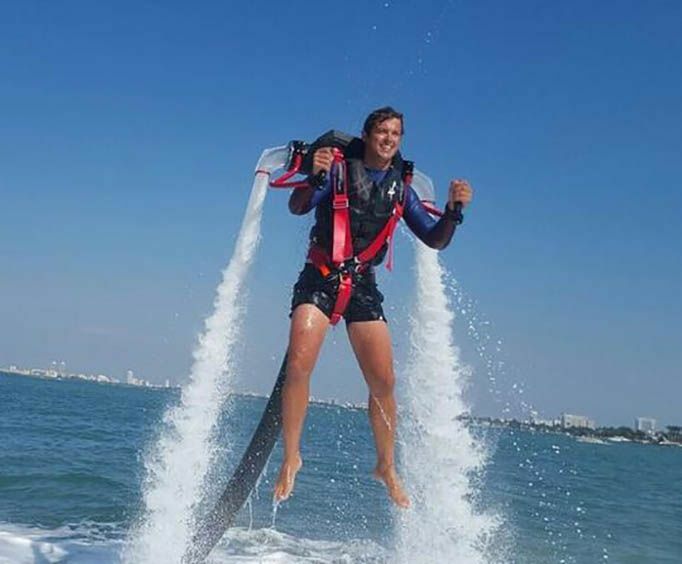 Fly over the beautiful waters of Key West, with the wind in your hair and adrenaline pumping through your veins, on a Jetlev R200 personal water-powered jetpack. This is an experience like no other - the sensation of soaring through the air, taking in the tropical scenery and amazing all whom you pass, will absolutely thrill you. One of Key West's most exciting activities, the Jetlev R200 lets you do what you've what you've dreamed about since you were a kid - fly! This personal jetpack uses water to push you up in the air, allowing you to soar above Key West's turquoise waters under your own control. A professional instructor will be with you every step of the way, providing direct communication through a waterproof wireless coaching radio and fly-by wire throttle control. Once you have demonstrated balance and control over the jetpack, your instructor will turn control of the throttle over to you. You'll be flying solo in no time with about 20 - 30 minutes of flight time! Need some technical details? Unlike conventional aircrafts and jetpacks, the innovative Jetlev concept greatly improves thrust-to-weight ratios by locating the propulsion engine, fuel and related systems on a separate vessel tethered behind the jetpack. It uses water as the jet propulsion medium because its high density can carry vast amounts of power at much lower velocities and generate nozzle reaction forces much more effectively than gases. Most people are able to fly under their own control in 6-8 minutes! Don't miss this out on this incredible water adventure.